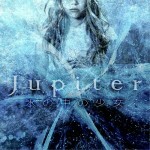 After last single ”LAST MOMENT” in March, Jupiter come back with new announcement. They will release new single with title ”氷の中の少女 / Kōri no naka no shōjo” on 26.10.2014. CD will cost 1,000 yen (tax in).